From the title of this post, can there possibly be a better combination of things?! 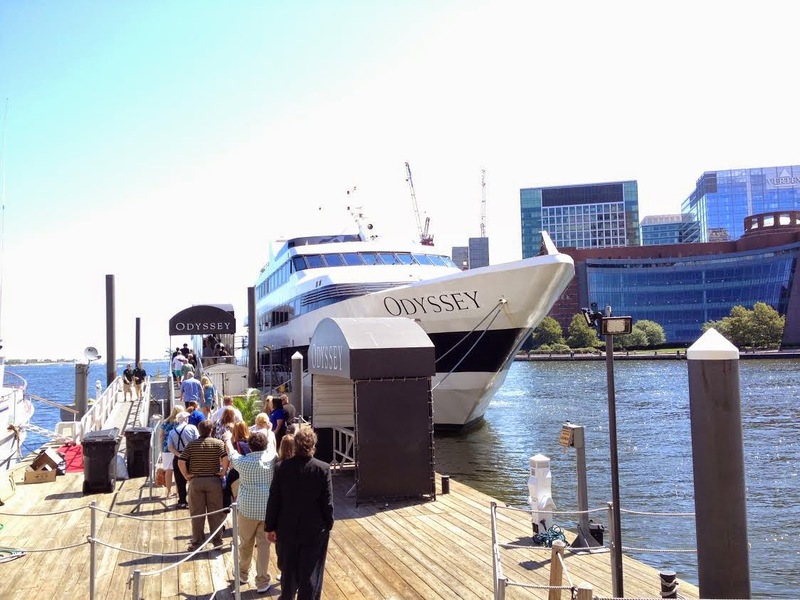 I mentioned on Monday, I was lucky enough to be part of Blog & Tweet Boston's group of bloggers to cruise with Odyssey Cruises this past Sunday for their Brunch Cruise. 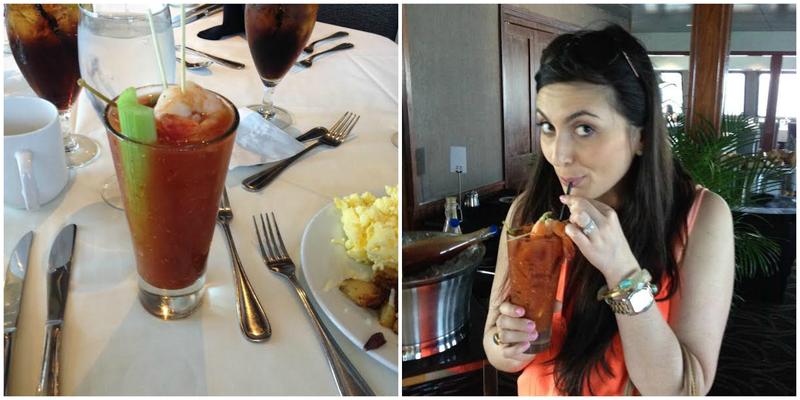 They were introducing their new "Bloody Mary & Mimosa Bar" and Gary and I took full advantage of testing them out!! 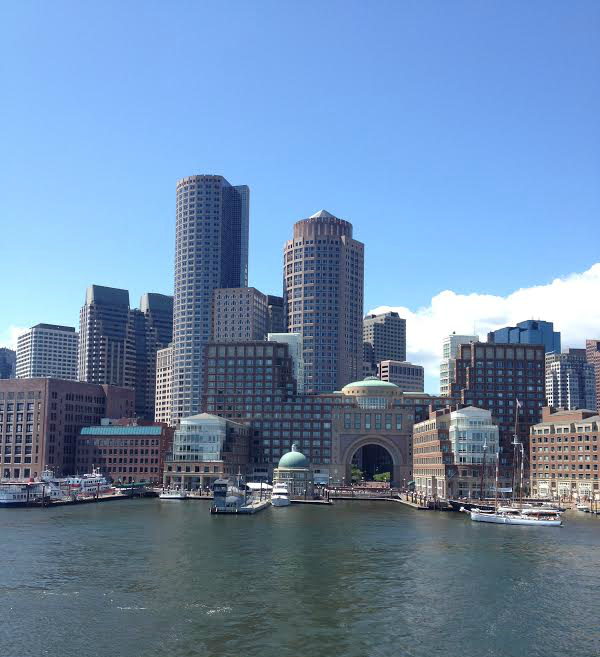 The boat boards conveniently at Rowes Wharf in the Financial District and you are greeted by friendly staff all the way through! 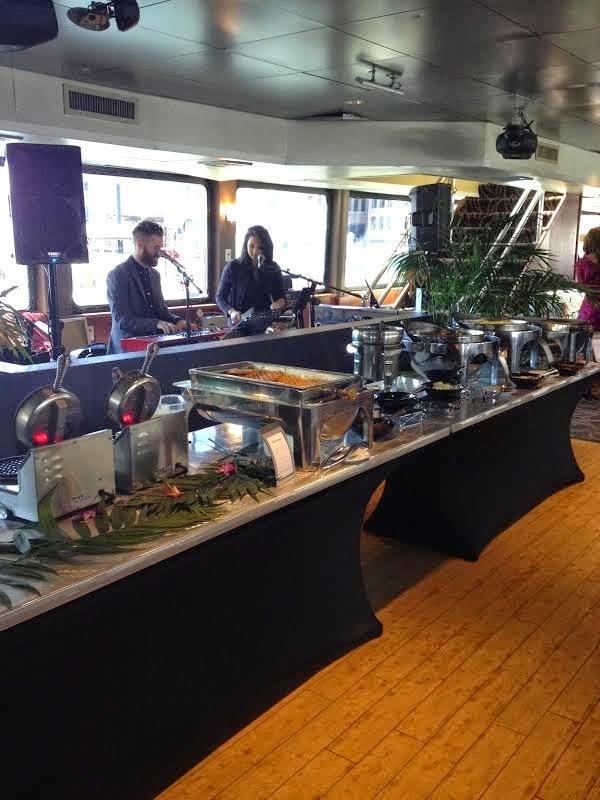 Even though the cruise doesn't depart until 1:00 PM, as soon as your board at 12:00 PM you are welcome to get started enjoying the food, drinks & music. Each setting has a champagne flute filled and ready to be consumed! There were three food stations for our deck, notice the made to order waffle bar!! 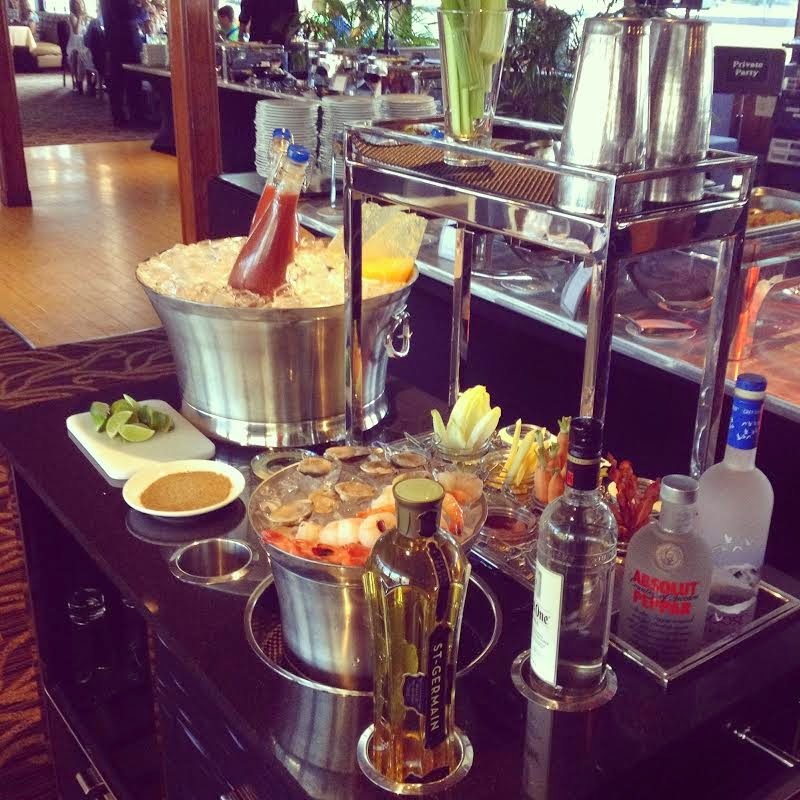 The Bloody Mary Bar Cart was one of the highlights of the cruise - do you notice the oysters and shrimp on the side to help adorn your drink?! After we stuffed ourselves, we went to take in the views! It could not have been a more perfect day for a cruise!! + Clearly my orange obsession is in full force as is my arm pop pose....I might have a problem! They've recently renovated their top deck - very swanky! 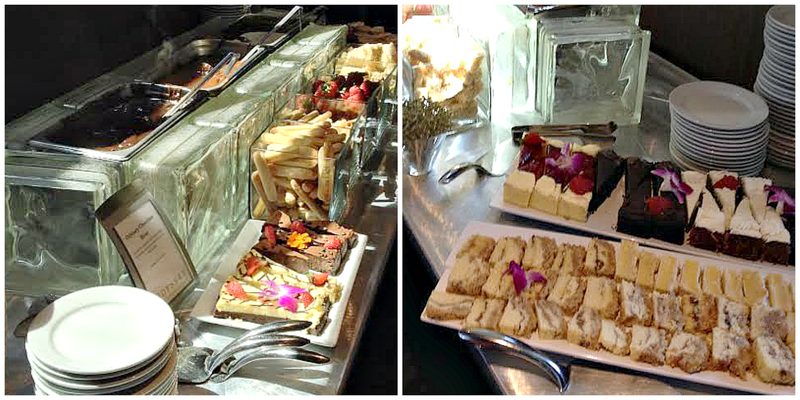 The dessert bar was the best way to cap off a pretty fantastic afternoon! I mean chocolate covered strawberries and rice crispy's drizzled with melted chocolate - heavenly! I honestly can't rave enough about this cruise!! 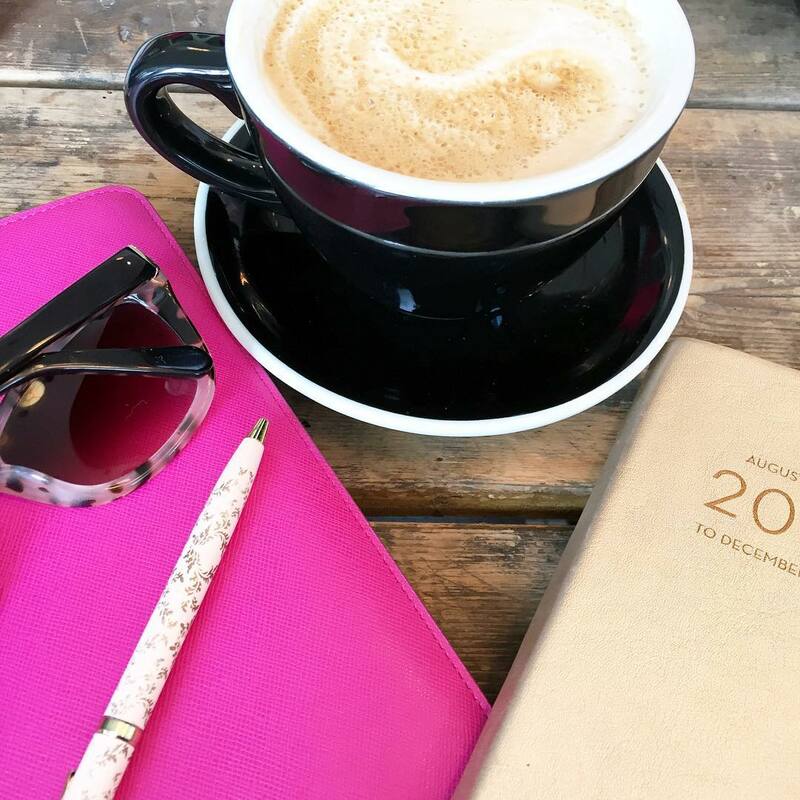 It's such a great treat while your visiting or if you live in the city and are looking for something a little different to do for a date night! I'm looking forward to a special occasion (hint hint to Gary) when we can partake in the dinner cruise because the views will be just as stellar! Also if you plan on visiting, Chicago, Boston or Washington D.C. - check out their cruises as well! 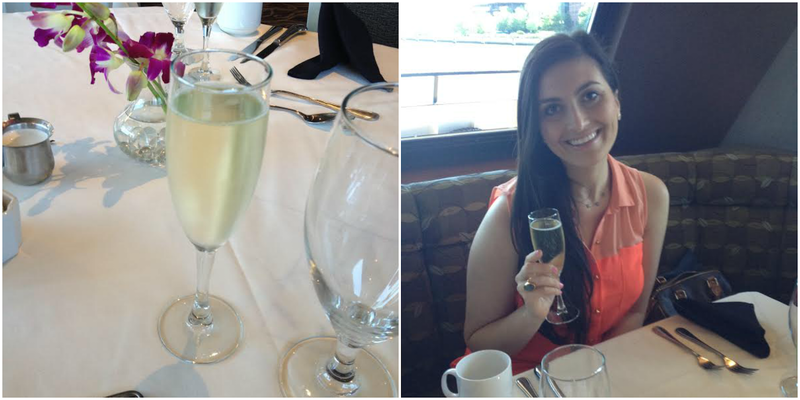 Have you ever taking a dinner or brunch cruise? Do you think you're a boat person? P.S. 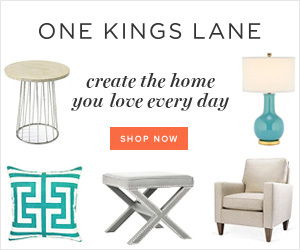 Have you entered the Go Chic Yourself Giveaway?! Disclosure: Gary and I received a free brunch cruise with Odyssey, with the exception of gratuity, which we happily paid since the service was outstanding. I was not compensated for my review and all opinions are 100% my own! Such a fabulous combination of two great activities - looks delicious! we did something like this when we went to vancouver and it was AMAZING!! the view was spectacular and the food soooo yummy. looks like a great time! Big time blogger perk! Looks like definitely a fabulous way to spend an afternoon. Is it weird I got so excited when I saw the picture of you and Gary? Can't wait to see you soon!!! Omg how amazing does this look?! All the food looks so yummy and a Bloody Mary bar what?! So fun and love you in orange! How fun! In high school, our post prom event actually was always on the Odyssey cruise line in downtown Chicago. They are so fun, and the food is delicious! hahah the arm pop pose. i know this all too well. every. single. picture. the orange looks good on you! i got an orange dress like that during the summer and it's one of my favorites! i'm not a boat person. i wish i was! This looks awesome! 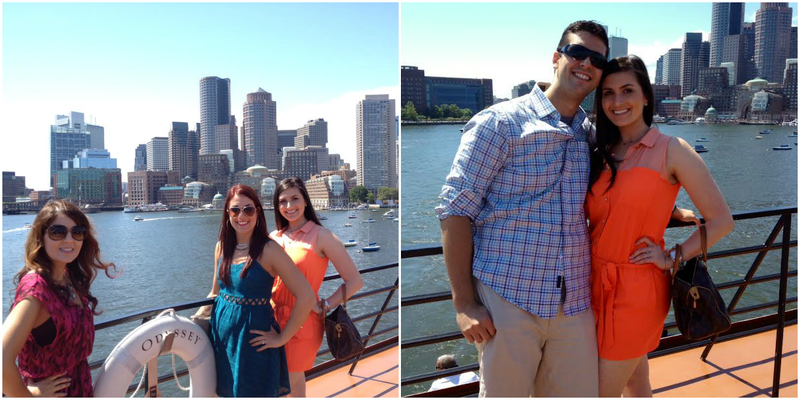 I lovee brunch cruises! That looks like so much fun! The bBoody Mary cart looks amazing! I will definitely have to remember this when and if I visit Boston! This looks like a blast! All that yummy food and drinks--- yes please! Looks so fabulous! I love me some champs and the food, oh the food. I'll have to check the DC cruise out! Ummm even more jealous of this amazing adventure now! The view is amazing, the food look delicious, and champagne? Well yes please! I'm definitely wishing we had something like that around here now!! Oh what fun!! Great pictures!!! 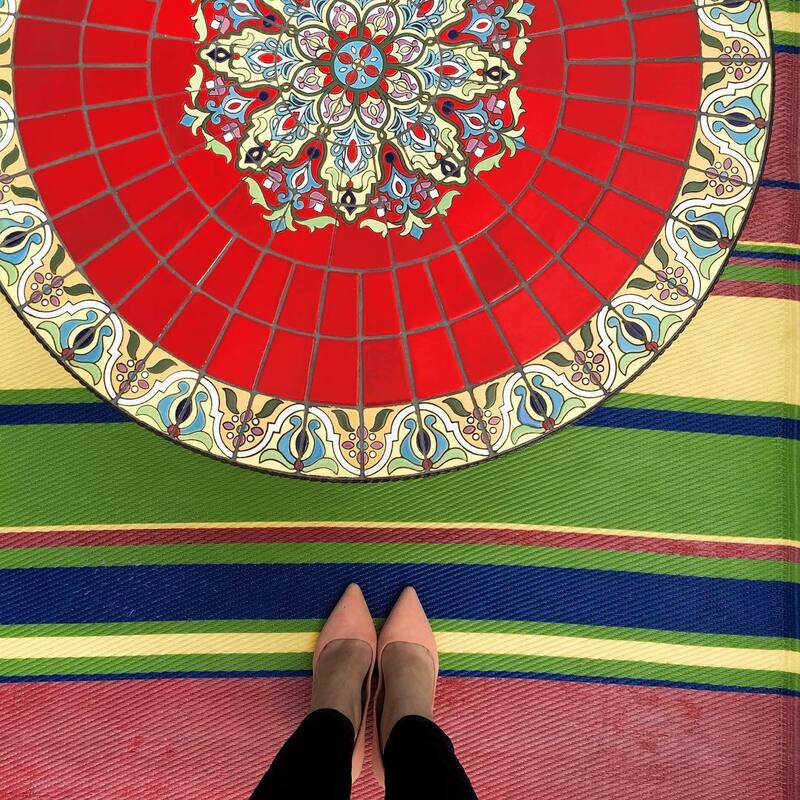 It looks like you guys had the perfect day-- so much fun! I think I could have stuffed myself on waffles alone! I had no idea this was what the cruises were like! I'll have to check it out! What an amazing experience! Anything that involves Mimosas and Bloodys is a must do in my book. Love the arm pop pose-its just such a natural stance for me these days that I don't even realize I'm doing it! Wow definitely two of my favorite things as well! Looks like the perfect way to spend the weekend. The bloody mary bar looks amazing! Looks beautiful (and delicious!) and that orange romper!! I am so jealous of this! Why cant I find something like this in NYC? I love your outfit, btw! Sometimes I wish I liked Bloody's because all those fixins look SO good! I'll just stick to Mimosas :) That waflle looked amazing by the way. I ordered one at a cafe this past sunday and they drenched it in what looked like strawberry pie filling so I didn't eat it :( I'm still craving one! This looks so fun! Sign me up for some mimosas any day! That waffle you made....mmmmm make me one too!!! I went on a dinner cruise when I was in New Orleans my senior year of high school, which was many MANY moons ago. (Before Katrina that is how old I am.) It was so fun to be on the boat and looking out into the city at night! Waffles, mimosas, and blood Mary's!? My favorite things ever! This looks amazinggggg! I wish Charlotte was on the water so I could do an awesome brunch cruise! I need to go one this thing asap, especially after seeing those waffles. YUM! oooh this looks fun! love your romper (dress?). love that color. That looks like so much fun!! We have friends in both Boston & D.C. so we might have to visit them sooner rather than later to go on one of these! Wow! This looks like an ideal way to spend a beautiful Sunday! The food looks delicious and the views are sensational! A waffle bar?!? Sold! We did an Odyssey Cruise in Chicago a couple of years ago and it was so much fun! They have the most amazing food... and city views from the water are always the best! BLOODY MARY CART!!! YES! I had a bloody mary with the pepper vodka and it was EVERYTHING! It was great meeting you and Gary! You got some great shots of the experience! Looks like a fabulous time! Mimosas would be my choice for sure! 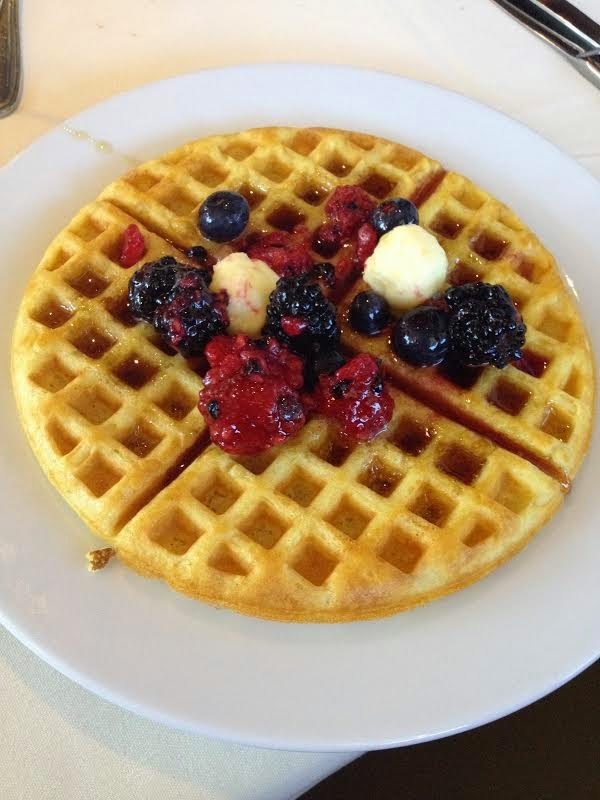 Made to order waffles, yum! this is amazing! charlotte needs more water to do this! or maybe i need to make a trip to boston :) & those waffles. girlfriend i would eat two of them too! No - there isn't a better combo!! Loved the pics, I'm jealous! What a fun blogger meet up! Brunch is my favorite meal so I'd be in hog heaven! The Bloody Mary bar looks amazing! Looks like fun! I love your outfit. Such a fun color! Anything that involves bloody Mary's sounds fantastic to me! Cruising and boozing is one of the finer things in life ;-)! It was great to meet you on the cruise and I agree, it was a perfect day for it and such a fun time! I'm sad we missed each other Tuesday night! Wow this looks amazing! Those views are to die to! How fun! That looks like a ton of fun! Great views too! Love all the pics! Looks so fun!